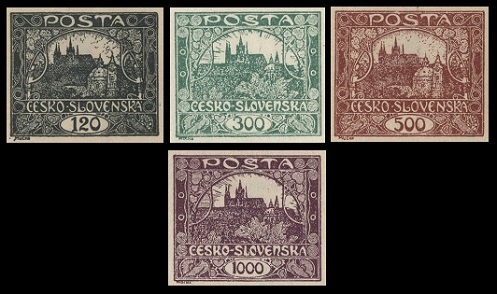 The first Czechoslovakia stamps appeared in December 1918, about a month after the end of World War I. The new Czechoslovakian Republic was created from the merger of the former Austro-Hungarian Imperial states of Bohemia, Moravia, Silesia, Slovakia, and Ruthenia. Before the first official stamps of Czechoslovakia were released, some of the existing Austrian and Hungarian stamps were provisionally overprinted. A few of them passed through the mail, but all of them have been pronounced as being unofficial and unauthorized by the Postmaster General. 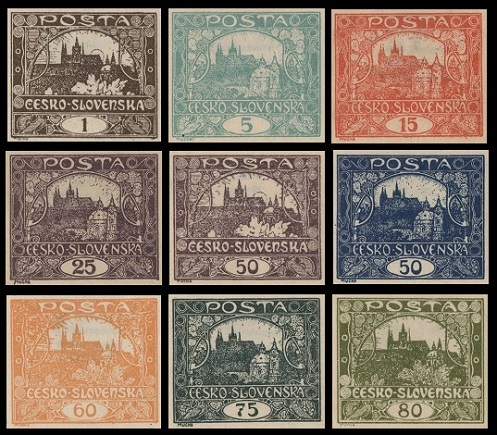 The first pictorial definitive Czechoslovakia stamps, shown above, were issued in late 1918 and early 1919. These new stamps were all typographed on unwatermarked paper. The designs feature the Hradcany at Prague. The side and top edges are inscribed CESKO / POSTA / SLOVENSKA. The tablet at the bottom of each stamp contains the denomination in Haleru (100 Haleru = 1 Koruna). The margins on these Czechoslovakia stamps are actually VERY WIDE. The examples shown have been cropped for easy arrangement within the combined images. 003 H. (1918 - Sc. #1) - Red Violet. 005 H. (1918 - Sc. #2) - Yellow Green. 010 H. (1918 - Sc. #3) - Rose. 020 H. (1918 - Sc. #4) - Bluish Green. 025 H. (1918 - Sc. #5) - Deep Blue. 030 H. (1919 - Sc. #6) - Bister. 040 H. (1919 - Sc. #7) - Red Orange. 100 H. (1919 - Sc. #8) - Brown. 200 H. (1919 - Sc. #9) - Ultramarine. 400 H. (1919 - Sc. #10) - Purple. 005 H. (1918 - Sc. #13) - Yellow Green. 010 H. (1918 - Sc. #14) - Rose. 020 H. (1918 - Sc. #15) - Bluish Green. 025 H. (1918 - Sc. #16) - Deep Blue. 200 H. (1919 - Sc. #20) - Ultramarine. The 3 H., 30 H., 40 H., 100 H., and 400 H. denominations, previously listed in the catalog, are now considered to have been privately perforated. 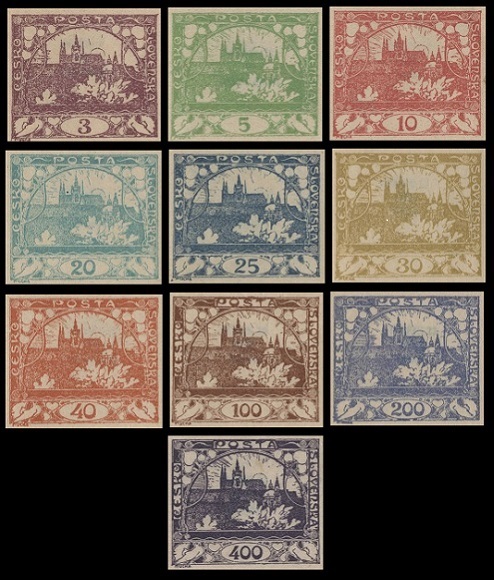 The thirteen new major type pictorial definitive Czechoslovakia stamps, shown above, were issued during 1919. These new stamps were all typographed on unwatermarked paper. These new designs also feature the Hradcany at Prague. The top and bottom tablets are inscribed POSTA and the denomination in Haleru. Across the middle of the stamps, between the vignette and the denomination tablet at the bottom, is the inscription CESKO-SLOVENSKA. The margins on these stamps are actually VERY WIDE. The examples shown have been cropped for easy arrangement within the combined images. Type II - Outline of the Sun behind the cathedral. Colorless foliage in the foreground. Type III - No Sun behind the cathedral. Shaded foliage in the foreground. Type IV - No foliage in the foreground. Positions of the buildings have changed, and the letters are redrawn. 0001 H. (1919 - Type II - Sc. #23) - Dark Brown. 0005 H. (1919 - Type IV - Sc. #25) - Blue Green. 0015 H. (1919 - Type IV - Sc. #27) - Red. 0025 H. (1919 - Type IV - Sc. #29) - Dull Violet. 0050 H. (1919 - Type II - Sc. #30) - Dull Violet. 0050 H. (1919 - Type IV - Sc. #31) - Dark Blue. 0060 H. (1919 - Type III - Sc. #32) - Orange. 0075 H. (1919 - Type IV - Sc. #33) - Slate. 0080 H. (1919 - Type III - Sc. #34) - Olive Green. 0120 H. (1919 - Type IV - Sc. #36) - Gray Black. 0300 H. (1919 - Type III - Sc. #38) - Dark Green. 0500 H. (1919 - Type IV - Sc. #39) - Red Brown. 1000 H. (1919 - Type III - Sc. #40) - Violet, Bluish Violet. The Scott catalog details for stamps that are officially perforated are as follows. (Please see the major catalogs for the listings of the various perforation gauges for each denomination). 0001 H. (1919 - Type II - Sc. #41) - Dark Brown. 0005 H. (1919 - Type IV - Sc. #42) - Blue Green. 0010 H. (1919 - Type IV - Sc. #43) - Yellow Green. 0015 H. (1919 - Type IV - Sc. #44) - Brick Red. 0020 H. (1919 - Type IV - Sc. #45) - Rose. 0025 H. (1919 - Type IV - Sc. #46) - Dull Violet. 0030 H. (1919 - Type IV - Sc. #47) - Red Violet. 0060 H. (1919 - Type III - Sc. #50) - Orange. 0120 H. (1919 - Type IV - Sc. #53) - Gray Black. 0010 H. (1919 - Type IV - Sc. #43a) - Yellow Green. 0020 H. (1919 - Type IV - Sc. #45a) - Rose. 0030 H. (1919 - Type IV - Sc. #47a) - Red Violet. 0030 H. (1919 - Type IV - Sc. #47e) - Deep Violet. The 50 H., 75 H., 80 H., 300 H., 500 H., and 1000 H. denominations were privately perforated. A branch postmaster also produced rouletted Czechoslovakia stamps of these designs, but they were not officially authorized by the Post Office Department. The Hradcany (English: Castle District) is the old district of Prague that surrounds Prague Castle. Construction began in the 9th Century, with some structures not being completed until the early 20th Century. Various palaces having belonged to Bohemian nobility. 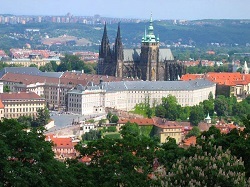 Prague Castle is in the Guinness Book of World Records as being the largest castle in the World. The interior of the castle is over 750,000 sq. ft. It is 1,870 ft. in length, with an average width of 427 ft. The castle has been a seat of power of the Kings of Bohemia, Holy Roman Emperors, and the presidents of Czechoslovakia and the Czech Republic. The Bohemian Crown Jewels are kept in a secret room within St. Vitus Cathedral. Reproductions of them are on display in the royal palace section of Prague Castle. St. Wenceslas Crown was originally made in 1347, for the coronation of the King of Bohemia and Holy Roman Emperor, Charles IV (1316-1378).